I’ve Seen the Tamaguchi One Before, And I saw a Green one buy the same seller for £15, with No Shipping Fees. I went upstairs to show my Dad, Looking at The Logo ONCE AGAIN, That’s when it Hit Me. I haven't seen any bootlegs in shops yet. I have heard stories of people claiming to find bootleg Tamas at gas stations (of all places) and dollar stores. It seems to be more of an online problem at this time. I think it would be bad news for Bandai and a lot of fans if the bootlegs became just as common outside of the internet. Ok, I must admit, I had a good chuckle at "Tamaguchi". Poundland, Hobbycraft, and Smyths are not selling fakes, as far as I know. They certainly carry generic virtual pets that usually use the same programming as some counterfeits found online, but those are not fakes, and I've never heard of or seen these stores selling fake goods - they are legitimate stores with legitimate suppliers and legitimate reputations, and they would face repercussions from the manufacturers and very likely the public if they were selling counterfeit goods in their stores. Part of the problem with these sorts of stories and claims is that a lot of people confuse "generic cheap item" with "fake", even though the former isn't trying to fool people into believing that it's legitimate like the latter is - it's even peppered throughout this very thread. Part of the problem with these sorts of stories and claims is that a lot of people confuse "generic cheap item" with "fake", even though the former isn't trying to fool people into believing that it's legitimate as the latter is - it's even peppered throughout this very thread. It's not too far off to assume a dollar store would be selling knock off items. I've noticed every time I have been in one there are fake Hasbro-based/inspired toys there. None of them look good. Isn't this brand of bootleg Tamas known for stealing sprites? If they are truly being sold at big name stores there could even be legal problems. IMO, they're still a fake. A lot of them use Tamagotchi branding or its marketing style to convince purchasers they're getting the real deal. Poundland carries items from legitimate distributors, including major name-brand overstocks - that's their gig. They're a major chain. They sell some weird or cheaply-made stuff sometimes, but they're not a commercial counterfeiting operation. They've been carrying generic virtual pets sourced from companies like PMS International and Keycraft Global for a couple of years, now. These are just generic items, after all. Moreover, there comes a point where the way that certain product-categories are marketed becomes scenes-a-faire - such as how any detergent commercial will feature someone exclaiming about how dirty the clothes are, followed by a similar exclamation about how clean the product has made them, and everyone expects to see this. I'm really interested in hearing more about these, mainly because fakes occasionally have interesting pre-existing generic software on-board due to it just being shoved into counterfeit cases in order to save on costs. The Works isn't listing them on their website (which is very rare for them), Poundland has only ever carried generics so far, and I wasn't even aware that Giga Pets knock-offs existed, since the present-day Giga Pets re-release isn't very well-known and is so limited in release that I can't imagine that it would have enough brand-recognition to make counterfeiting them worthwhile. Not to mention that Smyths Toys probably wouldn't want to burn their bridges with the legitimate manufacturer of those, considering how many exclusives they get (for non-Brits, Smyths is basically the UK & Ireland equivalent to Toys 'R' Us, just to give an idea of their reputation and buying-power). By any chance are you familiar with a youtube channel called Ashens? He reviews a lot of strange items from Poundland. Perhaps his videos are coloring my perception of the store, but he always seems to find strange/bootleg items there. This is showing how much I shop for Tama stuff online - I've seen these before, but always listed under "Tamagotchi". (Ebay sellers do this a lot) I didn't know before this that these were actually known as Cyber Pets. I guess the real villains here are the vendors? Well, those Giga pet Knockoffs are very similar, it’s really just the name. The font was different, and the whole packaging just looked cheaper and worse. 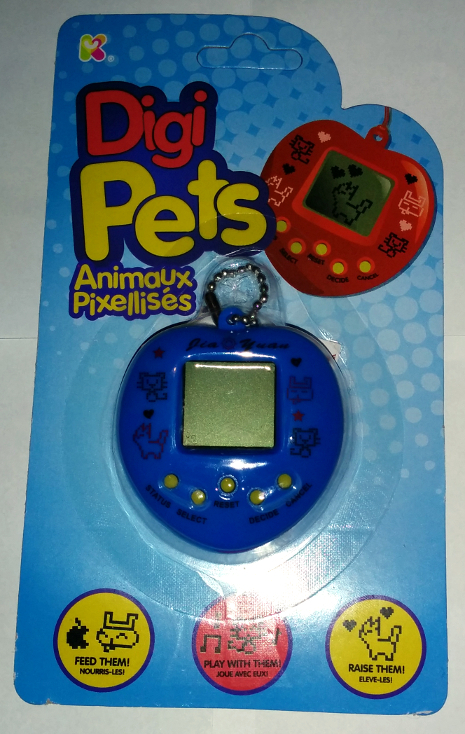 I didn’t have a camera, and I can’t find any pictures surprisingly (Also, I’m not a very big fan of Gigapets.) Because you’d think they would be on the website. Smyths, well it’s quite sad for all UK Tamagotchi fans. They completely got rid of any trace of them (Apart from Fakes) and they don’t even have the slightly more expensive P1/2s. I and other people have seen some Lego Competitors. For example, they do the exact same thing with Barbies and Playdough. They have the real item on one side, and some foreign company doing a copy, like the TamagUcci. I have seen a number of his videos, yes! Funnily enough, in some of his earlier Poundland videos, he actually jokes about how he's probably giving foreigners the wrong impression of Poundland, and in one he actually makes a point of saying that most of their stuff is good. He certainly picks some very choice tat to show, but that's why it's funny. The reasons that they're doing this most likely depend on where they're from - some people just use the word "Tamagotchi" to mean "virtual pet", after all. 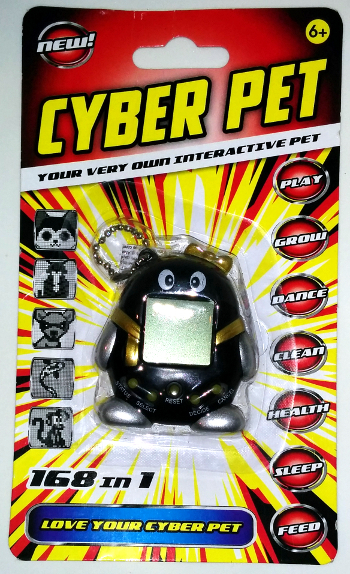 I didn't know before this that these were actually known as Cyber Pets. I guess the real villains here are the vendors? Part of the problem is people using brand-names as a generic term, for sure. There are definitely those who are using it to deceive (and they seem to be the majority, since it's usually associated with the notorious 4-button "Tamagotchi Connection" counterfeits), but in the case of well-meaning people who just bought a box of these generically-shaped, generically-packaged things from a distributor to sell on, they're just genericising proper nouns. I was never a big fan of Giga Pets either - the originals weren't very fun to run, because they were rushed out by a company who had been caught off-guard by a foreign craze that they clearly didn't quite get. Anyway, that's a pity - I'll keep an eye out! Thanks for the information. Smyths, well it’s quite sad for all UK Tamagotchi fans. They completely got rid of any trace of them (Apart from Fakes) and they don’t even have the slightly more expensive P1/2s. I and other people have seen some Lego Competitors. For example, they do the exact same thing with Barbies and Playdough. They have the real item on one side, and some foreign company doing a copy, like the TamagUcci. That's not quite the same thing. The "Tamaguchi" is a counterfeit, through and through - it's deliberately trying to fool people. Cheaper off-brand items that aren't trying to fool anybody but which are being sold in the vicinity of a brand-name item are not fakes or trying to fool anyone. That's just competition and catering to different segments of the market. Nobody's going to confuse Oxford Blocks for Lego (in fact, they're quite famous for their high quality as a competitor), and if they do then their reading comprehension surely needs some work.